Another Long Walk: Day 10: A Proposal and a Surprising Ride! I knew today would be an interesting day. The rest of my trip, as a whole, had been well-planned out. I knew where I would wake up each morning and where I needed to set up camp at the end of the day. Since I'd done this trail before, I even had vague memories of what kind of views to expect and what the trail would be like. 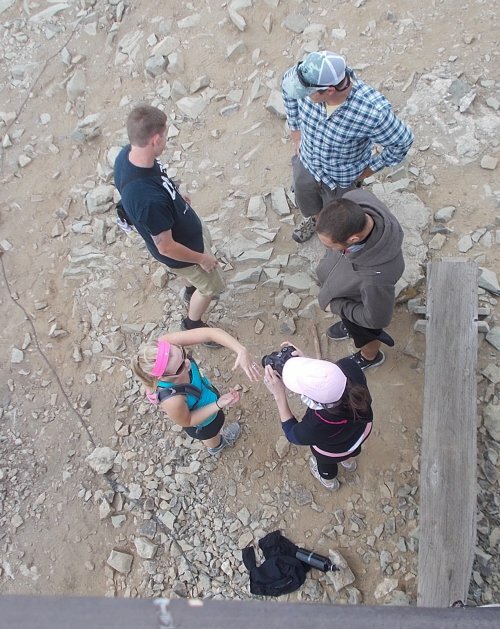 My biggest surprise to look forward to each day was what kind of people I might meet along the trail. That's the one thing I can't really predict. 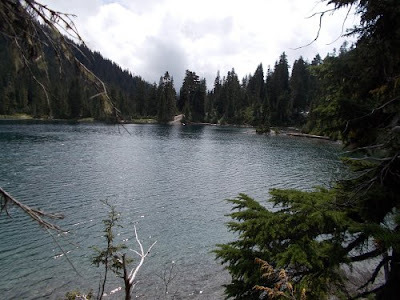 But today, I had a wildcard that would undoubtedly keep things more interesting than usual: I had no ride off Mount Rainier when I reached Mowich Lake. I was going to have to make a friend somewhere along the way who could get me off this mountain. =) Well, technically, I could just walk off the mountain, but the road walk to civilization didn't really have much to be desired. No, I was going to have to work myself a ride off this mountain. And it meant that I wasn't entirely sure where I would end up at the end of the day. Ideally, I'd end up at home, safe and sound in Seattle. But I might wind up stuck in Auburn for the night and checking into a motel. Or, worst-case scenario, I found myself stuck at Mowich Lake for the night. Who knows? It didn't rain during the night, but fog had rolled in severely limiting visibility. I hoped it would burn off quickly, but it seemed quite thick and there was a 30% chance of rain for the day. Not great weather, but it could certainly have been a lot worse too. 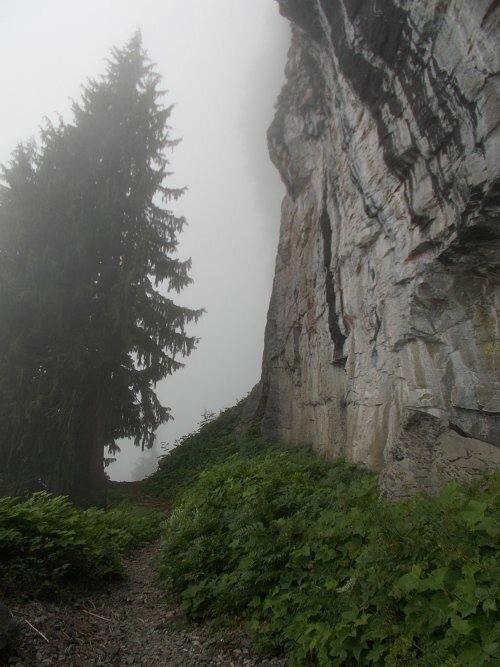 Out of the Ipsut Creek Campground, the immediately started climbing steeply and the fog only got thicker the higher I climbed. First through a thick, lush forest, then the trail climbed even steeper when it broke out of the trees up a series of switchbacks to Ipsut Pass. At Ipsut Pass, I reached the trail junction for Tolmie Peak, and I waffled about whether I'd take it or not. Originally, I definitely wanted to take the side trail to the fire lookout tower on Tolmie Peak, but given the thick fog, it seemed unlikely that there would be any views at all. It could turn into a nearly 4-mile round-trip hike to see absolutely nothing. So I waffled a bit, resting to eat some snacks while I thought about what I wanted to do. It was still fairly early in the morning--not even 9:00 in the morning yet. I hadn't even seen any other hikers on the trail yet, and at my current pace, I'd probably reach Mowich Lake before 10:00. And... that was probably just too darned early. Nobody would be driving down the mountain that early in the morning. There were probably a billion cars driving up the mountain for a Saturday afternoon, but they wouldn't be driving back down until later in the afternoon. 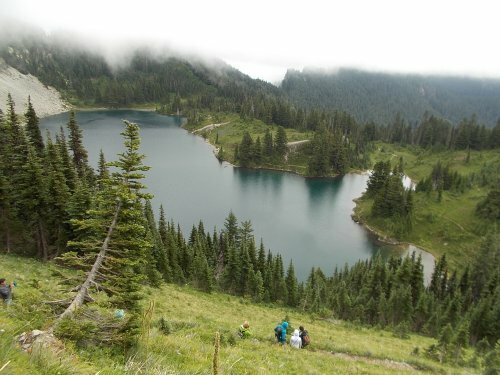 I'd probably get to Mowich Lake and spend hours just trying to find a car going down the mountain instead of up. I followed the trail, which passes by Eunice Lake. A sign on the trail announced my arrival at Eunice Lake, and I looked off the side of the trail and saw a small, pathetic puddle of water. Seriously? 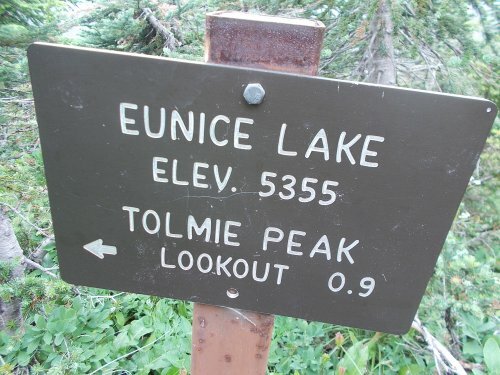 That was Eunice Lake? Would they even bother to put a pool of water that small on a topo map? I couldn't imagine it. It was nothing! I did see some social trails running past the puddle and over a ridge, and I wondered if the real lake was hiding out of view. 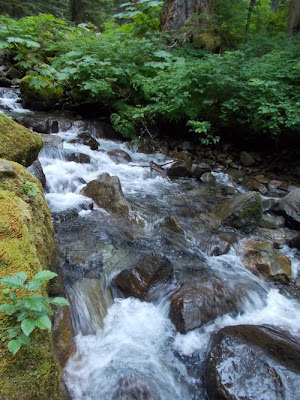 And anyhow, I had to kill time, so I followed the social trail, crested over the ridge and saw.... a lot more water. Now that looks like a lake! Not that I could see much of it. At best, I could see maybe 50 feet out before the thick fog blocked any further views. There was clearly a large body of water in front of me, but I had absolutely no idea how large it might be. I went back to the main trail and continued onwards to Tolmie Peak. I passed two separate couples who were already hiking back down from the peak. "How are the views?" I asked, joking, "I bet they were awesome!" But they did give me some hope saying that occasionally, if you were patient, there were breaks in the fog just large enough to get a couple of small views. I continued onward, soon reaching the fire lookout tour at the top. On the exposed peak, the wind was absolutely howling. A cold wind that could knock you over. I looked up, briefly, and about tripped over myself when I saw Mount Rainier looming high above me. Holy crap! 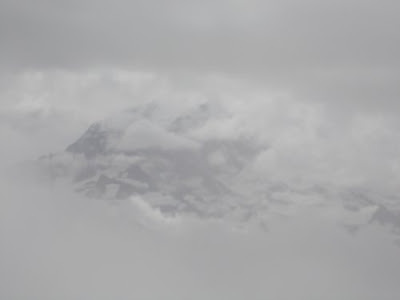 The mountain looked like it was floating above the fog completely unattached to the ground and my jaw dropped open. I grabbed for my camera--I needed a photo!--but I wasn't quick enough--in two seconds flat, the wind had carried in a thick fog that completely blocked the mountain. I was crushed. It was, hands-down, the best view I had seen of my entire hike, and I didn't manage to get a single friggin' photo of it. Completely unexpected. I didn't really expect to see anything and the view took me by complete surprise. I think that was part of it's allure--the shocking surprise to look up and see this magical mountain seeming to float above me. Maybe another wind will blow the fog away, though--at least long enough for me to get a photo of the scene. I was less than impressed with Eunice Lake. When I arrived, there were three people already there milling around, mostly in shorts and I couldn't help but think they must have been freezing their asses off. One of them started quizzing me if I had passed anyone on the trail, and I told them of the two couples of people I had passed who were already heading down. 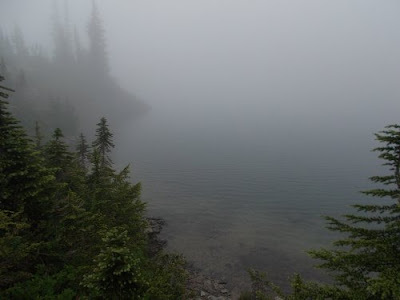 I also heard voices coming from Eunice Lake, but I didn't see anyone over there due to the thick fog. Then they told me that they were waiting for a couple of friends to arrive, one of which was going to propose to the other there. "I'm sorry," I told them. "I didn't see anyone at all going up the trail. I have no idea where they are." The three moved around the summit, looking for hiding places behind bushes and trees and trying to stake out a good place to photograph the proposal without getting caught in the act. I found the act kind of amusing, really. I walked up to the second level of the fire lookout tower hoping to get that much better of a view, but also because two of the four sides offered excellent protection from the wind as I waited for Mount Rainier to show its face again. came out to this. Okay, now THAT'S what I call a lake! Even if I can't see more than 50 feet across it. It also gave me a slightly better view of the trail to the summit than the other three people had. "You know," I told them, "I could tell you when I see someone coming up the trail. They wouldn't know me so I can stand out in the open without worrying about being seen by them." 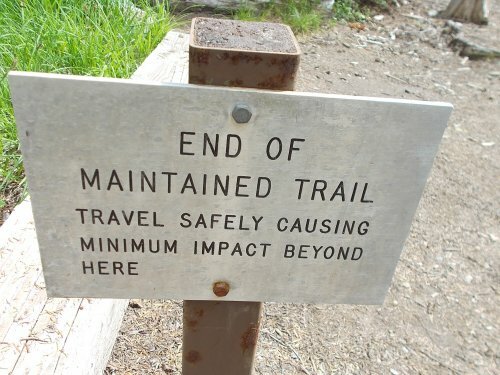 They liked this idea, but one of the guys decided to go down the trail to act as an even more advanced warning system. He came back several minutes later saying he had found a good vantage point and should see them coming early without being spotted himself. I wondered where that was, but I wasn't going down to check it out. I was perfectly happy from my perch on the fire lookout tower, using it as a break from the bitterly cold wind. The three of them went back to their hiding places, and I paced back and forth trying to stay warm while watching for Mount Rainier. About five more minutes passed when the advanced warning system came running up the trail, whistled softly and swirled his arm in the air before dashing behind a tree. Their friends had arrived. 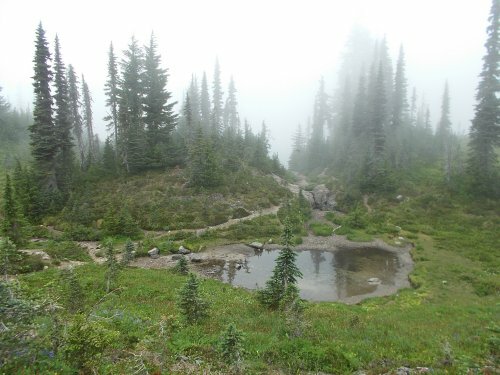 I stopped looking for Mount Rainier and started looking down the trail instead. For about a minute, I saw nothing. I couldn't figure out how the guy could have seen them so far in advance through such a thick fog. Maybe it was a false alarm? It wasn't a false alarm, though. I saw the young couple heading up the trail. And good grief, in shorts and T-shirts too? How were these people not freezing to death on this trail?! 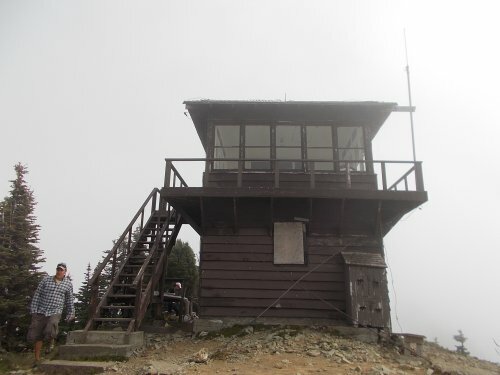 The fire lookout tower on Tolmie Peak. I lost sight of them when they stepped under the patio of the fire tower I stood on, but I heard them walking around the fire tower. I cringed a bit. One of their friends was hiding behind the fire lookout tower, and I was pretty certain she wasn't supposed to be found quite yet. Then I heard the girl gasp in shock almost directly under my feet. I couldn't help but laugh to myself thinking, "Whoops--I think she just saw someone she wasn't supposed to see!" By now, all three of the friends had come out of hiding and were snapping photos like there was no tomorrow. There was laughing, there was crying, there was a lot more hugging and congratulations going on. I quietly just lurked on the fire tower and eavesdropped and restarted my watch for Mount Rainier. Several times over the next hour and a half, the wind started to blow the fog away and Mount Rainier started to peak out, but never as clearly or as full as those brief two seconds I saw it when I first got to the mountaintop. I clicked away with my camera anyway, hoping for the tiniest of windows to Mount Rainier. One second.... that was all I needed. One second of an unobstructed view. The party below had popped out a champagne bottle and were obviously feeling quite festive. I couldn't really blame them either. They all looked so happy. 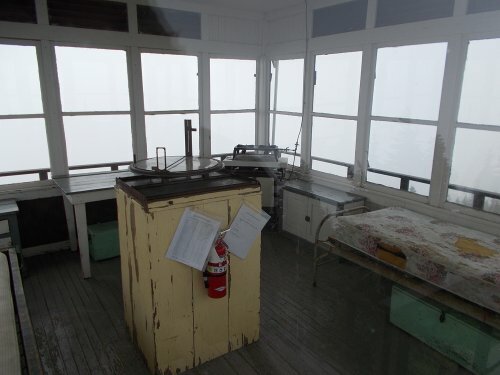 Inside the fire lookout tower. More people started arriving at the fire tower. First a mother and son team arrived at the top. Then a group of half a dozen guys who sounded like they were speaking Russian or something which kind of intimidated me. They all looked like they could have been from the Russian mafia for all I knew. Then an even larger party of Spanish-speaking people arrived. The fire lookout tower was starting to grow quite crowded and after over an hour, I was getting tired of waiting for Mount Rainier to show itself properly. 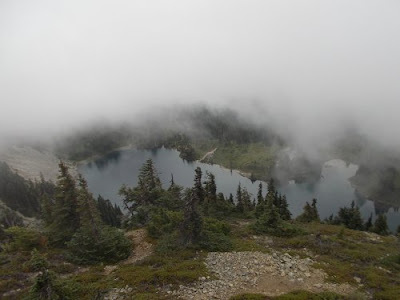 The one good thing my waiting did bring me was that the fog immediately below the fire lookout tower cleared out to a large degree and I finally got my first good look at Lake Eunice down below--an impressively large lake laid out at the bottom of the ridge I stood on. I snapped photos of that, then headed back down the trail. All-in-all, I was pretty glad I made the trek up to Tolmie Peak. I didn't have high expectations, but I got to watch a proposal, saw one absolutely jaw-dropping (albeit short) view of Mount Rainier, and a better than nice view of Eunice Lake. Not to mention that fire lookout towers are always fun to explore as well. To think, I almost missed all of it when I considered skipping the side path! But I'd try to find a ride at the parking lot of Mowich Lake from people who were already planning to head down the mountain. These people might linger at Tolmie Peak or Eunice Lake all day long for all I knew. on the right are the friends that ambushed them. to forget that I was up on the fire lookout tower. The rest of the way to Mowich Lake was more-or-less flat and quick. 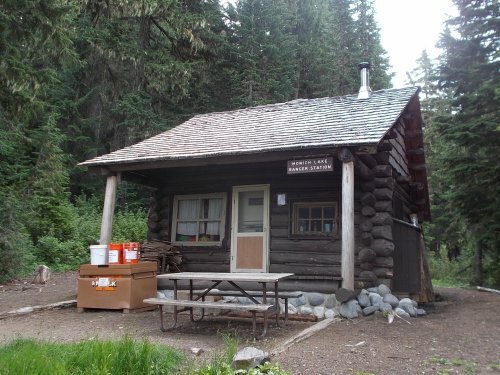 I followed the Wonderland Trail around the edge of the lake and decided that my "finish line" would be the ranger cabin on the other side of the lake which is where I headed. I reached the ranger cabin and gave myself a mental pat on the back. My hike was done! Now I just had to get back to civilization. I didn't even care where--there was only one road out from Mowich Lake, and no matter where someone was headed, it would be almost impossible for them to drive somewhere that didn't involve passing a bus stop that could eventually get me back to Seattle. I put on my pack and started walking back to the parking lot when I passed a ranger walking to the cabin. "Woo-who!" I told him as we passed each other, "I finished the trail!" He stopped briefly, turning around since I had already passed him. "Do you have a ride down the mountain?" he asked me. "Well, no," I answered, "not really." "But you have a car in the parking lot, right?" "Well, no, I don't have that either." "How are you getting out?" I started feeling a little uncomfortable now. I wasn't actually sure if hitchhiking was illegal or not in the park, so I didn't really want to tell him that my plan was to hitchhike. "Just start walking, I guess." And in my head, I was thinking, Great. Now I'm going to have to walk out from here. Why can't you just keep your mouth shut! started fading into view... before it was completely blocked again. "Umm, okay. There's a wheelbarrow up at the campground. Go up there and wait for me. I want to talk to you about that." I walked up to the campground where I saw the wheelbarrow. There was also a young girl standing by it, kind of looking aimless and bored. "You look like you've been grounded," I told her. I wondered if she might be the same 16-year-old girl I had read about who was getting off the trail, and I was trying to figure out if the ranger had told her to also wait by the wheelbarrow. I don't remember exactly how the conversation went after that, but I got the sense that she seemed a little leery of me. Why was this strange guy taking such an interest in a 16-year-old girl kind of leery. So I told her that I had bumped into a ranger who told me to wait for him by the wheelbarrow. See, I'm not a crazy guy. I've been grounded to the wheelbarrow too! That seemed to relax her a bit, and she said that she'd been ordered to watch the wheelbarrow. Or maybe guard it. "With my life!" she exclaimed in exaggerated tones. "With your life?" I asked. "That seems a little extreme for a mere wheelbarrow...."
She had a British accent, or at least that's what the accent sounded like to me. I'm not really an expert on accents, though. Definitely not local. "Where are you from?" I asked. "Redmond," she answered. Okay, maybe it was local--but not like any local accent I'd ever heard before! I was really more curious where the accent was from, and I'd have bet my entire life savings it wasn't from Redmond, but I didn't pursue the questioning any further. I still felt a little creepy chatting it up with an unaccompanied 16-year-old girl already. Mount Rainier--but still with half the mountain obscured! ARGH! I have about a hundred of these kind of photos. Fortunately, I didn't have to think of much more to say because the ranger arrived at about this time and he told me that he had to drive the girl down to the Carbon River Ranger Station and that he could give me a ride down the mountain at the same time. We headed to his car and loaded up. We chatted on the drive down the mountain. I told them about starting from Sunrise and turning the 93-mile Wonderland Trail into a 140-mile hike. The girl told us that she had hiked half the Wonderland Trail and intended to do the entire thing but simply ran out of food. She was a lot hungrier than she expected and went through her food supply much faster than she had expected. The ranger told us about his job and what was going on in the park. Apparently, it was a busy day at the park--he was supposed to limit his use of the radio because some sort of emergency was happening in the park and the radios were supposed to stay clear for the rescue efforts. He wasn't entirely sure what was happening himself and on our way out of Mowich, he saw another ranger checking permits on cars and pulled over long enough to ask if he had heard anything about the emergency that was going on, but the other ranger didn't know anything about that either. Just that they were supposed to limit the use of their radios. The first stop was the Carbon River Ranger Station where he dropped the girl off. Her mother was supposed to drive there to pick her up, and in the meantime, it was a safe and accessible place for a 16-year-old girl to wait for her mum. The ranger manning the desk at the ranger station didn't know anything about the emergency that was happening either saying that the place had been packed with visitors she was helping. "You wouldn't believe all the permits I've issued today!" she told him. I looked up at the map of Mount Rainier and the available campsites--the same map I looked at 9 days earlier--and couldn't help but notice that the only two campsites that still had room for the night were Sunrise and Paradise--the exact same two I could choose from when I started my hike. I guess those two sites just don't seem to fill up. Eunice Lake was starting to come out from the fog, though. The ranger asked where I needed to get to, and I told him Seattle. His eyes opened wide and she said he couldn't take me that far. "Of course not!" I agreed. "That's just my destination for the night! I only need to get to a transit center where I can catch a bus to Seattle." He didn't know where there were any transit centers, and to be perfectly honest, neither did I. The ranger manning the ranger station, however, said she knew there was a bus stop in Buckley. Which, as it turned out, was only about 4 miles out of the ranger's way. He needed to drive to Longmire and was going to go through Wilkenson a scant 4 miles from Buckley. Then he drove me down to Buckley where we started keeping our eyes open for a bus stop. Buckley isn't a big town--certainly it wouldn't be hard to find a bus stop. We didn't see one immediately, but he did see a Subway and asked if I'd mind if we stopped for lunch. So we went into Subway for lunch. I asked the workers inside where the nearest bus stop was, and was told that there used to be one in Buckley but due to budget cuts, it was shut down and that now the nearest bus stop was in Enumclaw. Then he proceeded to give me a series of directions that were quite lengthy and involved, most of which went over my head except the part that there was a bus stop by the courthouse in Enumclaw. I paid for my sandwich and joined the ranger at the table who had already starting digging into his meal. "Did you catch all that?" he asked me. "No, not most of it," I answered, "But I did get the part that the nearest bus stop was by the courthouse in Enumclaw. Think I can get a ride to Enumclaw?" He seemed conflicted about that, and I told him not to worry about it. It was just two or three miles away--I could probably walk there in an hour if I had to. He'd already done me a huge favor just driving me off the mountain which was already far more than I ever expected. "I don't think Enumclaw is just a couple of miles away, though," he told me. "I think it's more like 20." Now, I have to admit, I don't go to Buckley or Enumclaw all that often, but I was absolutely certain that they weren't more than a few miles away from each other. Buckley is practically a suburb of Enumclaw. I wished I had a map of Washington state to show him just how close Enumclaw really was. Then I remembered.... I didn't have a map of Washington state, but I did have the Mount Rainier National Park brochure they'll give visitors to the park for free, and the back of it usually has a tiny map showing the major roads into and out of the park. I ran back to the car and pulled it out of my pack, and much to my delight, it actually included both Buckley and Enumclaw on the map, bare millimeters from each other. It didn't list distances, but clearly, the two towns were practically right on top of each other. He looked at the map and said that yes, he could take me the extra couple of miles into Enumclaw. We finished our sandwiches and piled into the vehicle again. Pulling out of the parking lot, we saw a mileage sign which fixed Enumclaw as being 4 miles away. So, okay... maybe a mile or two further away than I thought, but still, not terribly far out of the way either. Not for a car, at least. I had no idea where the courthouse was in Enumclaw, though, so I didn't know where the bus stop was either. We did see a sign that suggested we turn there for "downtown Enumclaw" and I suggested we follow it. Courthouses are usually located downtown and we couldn't possibly go wrong if I'm dropped off downtown. 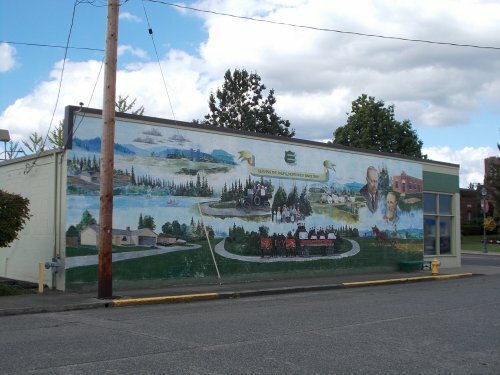 We got into what was clearly the downtown area of Enumclaw looking for a courthouse and/or bus stop. We didn't see anything immediately, but we were definitely downtown and at a stop, I told I'd just get out there. I could get around on foot and just ask somewhere where to go at this point. I thanked him profusely for the ride, and he just waved it off saying he was just doing his job. "It's my job to help visitors," he told me. Yes, perhaps, but I didn't think his job description included being a taxi service either, but I still appreciated his efforts. He went above and beyond in my opinion, even if ultimately, he actually only drove 8 miles out of his way to drop me off in Enumclaw. I waved goodbye and he drove off,, and I started walking around Enumclaw. 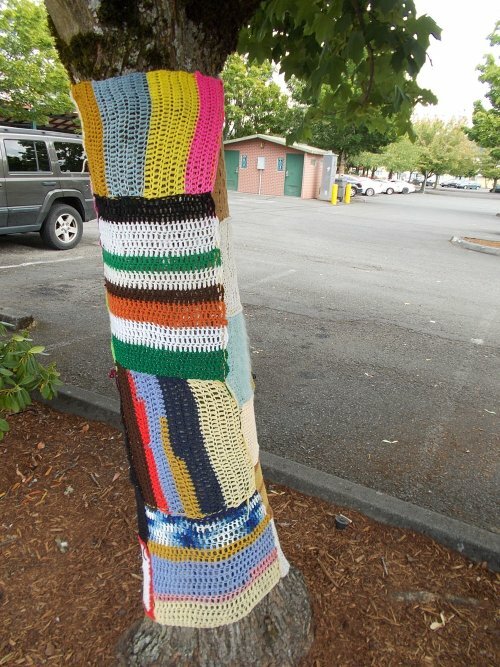 The first thing I found was yarnbombing, though, so naturally I had to get photos of that. =) I walked down a block where I found a road named "Griffin." That name rang alarm bells in my head. I'm absolutely certain that the guy who was trying to give me directions to the courthouse in Enumclaw had mentioned the word "Griffin" at some point. I sensed I was getting close. I looked up and down the block, and I saw a bus stop down the street. Yes! 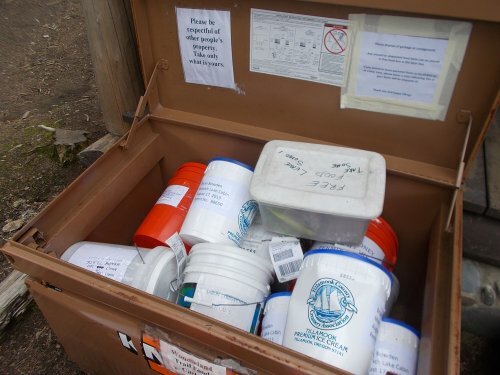 Food caches at the Mowich Lake Ranger Station. I walked over to the bus stop and checked the schedule they had posted. Two of the three buses scheduled went to Auburn while a third line went to Renton. It was Saturday, though, and only one of the lines actually ran on Saturday--a bus to Auburn. And--curses! I missed it by about five minutes! The bus arrived--a really small bus. I'm so used to riding on those articulated buses in Seattle, I sometimes forget that there are small buses being used on less-traveled routes. I paid the $2.25 fair and got my ride to Auburn. At Auburn, I checked the bus schedules and found a Sound Transit bus that would whisk me from there to downtown Seattle in another half hour or so. Perfect! I got off at 4th and University, at which point I didn't need a schedule to know I only had to walk a block west to 3rd and University to catch the C Line into West Seattle and home. on the left--along with three food caches that wouldn't fit in the bear-proof box. good blog post, Ryan! Fun stuff! Great pictures! Thanks for taking us along on your hike. It was a pleasure. Have you ever thought of going into the postcard business? Absolutely stunning images. Thank you again for allowing us to tag along.